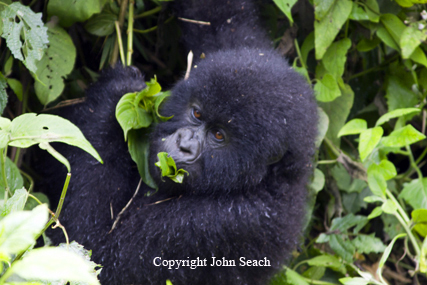 The Virunga National Park was inscribed as a World Heritage site in 1979. The Virunga Range contains 9 volcanoes. The areas of lowest and highest rainfall in Democratic Republic of Congo are found in Virunga National Park less than 75 kilometers apart. Rain falls all year but more heavily from March to May and mid-September to mid-December, with drier spells following each. Annual rainfall averages 500mm at Lake Rutanzige, 900-1500 mm on the plains south of the lake, decreases higher on the volcanoes but on the west slope of the Rwenzoris orographic precipitation is almost 3,000 mm. These mountains have heavier snowfall than Mounts Kenya or Kilimanjiro, are permanently ice and snow-covered and carry small retreating glaciers. The Virunga Volcanoes form part of a larger landscape of contiguous protected areas known as the Greater Virunga Landscape. This landscape is one of the most species rich in Africa and contains more vertebrate species than any other group of inter-connected protected areas on the whole continent and possibly the world. the endemic vertebrate species found in the Albertine Rift. The Virunga volcanoes have a total of 86 species of mammals. The larger mammals include the mountain gorilla (Gorilla beringei beringei), buffalo (Syncerus caffer), bushbuck (Tragelaphus scriptus), black-fronted duiker (Cephalophus nigrifrons) and elephant (Loxondata africana). There is also the endangered golden monkey (Cercophithecus kandti) known only to occur in the Virunga Volcanoes and the blue monkey (Cercopithecus mitis).